I had a baby in the Queen Mum's on Monday. Of course, the press has been full of Queen Mum's stories all week because it was shutting down on Tuesday. Thomas spotted this story. Doesn't the setting looked eerily familiar despite the 46 year gap? I had been ranting all last week about the QMH shutting and the possibility of being forced to hunt out the Southern General at a minute's notice while in labour, having never even visited anyone in that hospital, but now that the stress of last week is over, I have had time to reflect on why I wanted to make it to the QMH. Obviously I had had all my kids there so I know the place inside out and many of the staff. I can find my way around in the dark! They had all my ante-natal notes, so of course it was sensible, but it was much more than that really. Sentimentally, the QMH is the first memory I have in my life. I was taken up the green, buttercup-covered hill in a part of the city I didn't yet know but which was to become home 20 years later, one day in June 1971 carrying a toy lamb to visit my new baby brother. The weather was beautiful, the hill and flowers are so vivid, it could be yesterday. 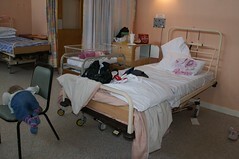 I remember the wards and beds. I remember being with my dad. In fact, ironically, the only two things I don't remember of that day are my mum and baby brother. I didn't want my first ever memory to shut down! Then there are my own kids. I remember which room each one was born in and every minute of every labour. You don't want want those memories to shut down either. After my first baby was born I joined the QMH breast-feeding group. We met every week, though none of us really needed the breast-feeding support, we all needed the moral support. I met Karen, Cynthia and Siobhan - friends for life... breast friends. We had more babies together, and more tea and cake. We've helped each other through the highs and lows of life ever since - all our divorces and new lives. That nostalgia was dying too with the QMH. I realized after the dust of the last week's stress settled that what you need when you are having a baby is to feel at home because you are so vulnerable and the QMH to me was a kind of home - like a home-birth with all the trimmings - someone else to clean up and all the medical back-up you might need should your 10lb baby become stuck at birth. Even the revolting school dinners they served after you had the baby had a way of tasting acceptable in all their stodginess. My last meal there - of two wet beef burgers, heavy mash and over-boiled cabbage will live with me forever! Shame on you whoever decided to close it :-( Now I will need to give serious consideration to calling a halt to my childbearing years! Really nice piece of writing. Very evocative. How sad - but at least Amaia was born there after all. But the hospital food doesn't sound like something one would miss greatly! Just after having Ellen I was offered freshly made sandwiches on a tray with colored napkins and a flag. And at dinner the same day we had a nice roast with glaced onions, delicious "sovs", beans and everything. The food at Randers Sygehus is great.